Last night I finished up all the charts for this Lizzie Kate Halloween Rules and started the free top part and the border..I know how I am going to finish it so I really want to have it finished to use for this Halloween ! It is pretty big ( long) I still have to sew all the little buttons on also.. 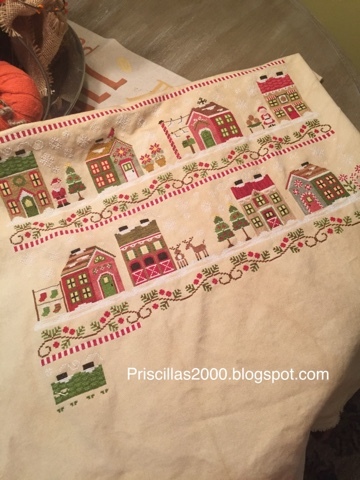 I have kept up with this Santa's Village from Country Cottage Needleworks .. The bottom left is Septembers chart ( for me) so hopefully it will get finished before October..
and I finished the 3rd ornament from the first collection of Hands On Designs chalkboard ornaments.. I replaced the brown color floss with white for this one.. 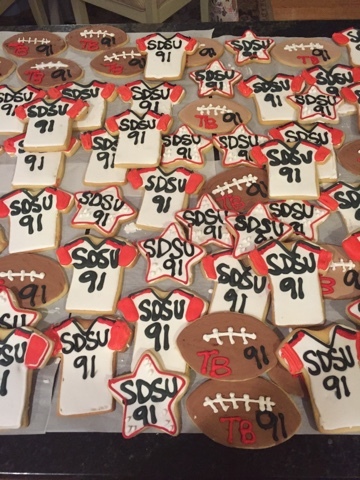 I have started one of the second collection but not enough to show..
My son is the punter for San Diego State University and they came last Saturday to play here in Illinois at Northern Illinois University .. so I had to make some sugar cookies for our tailgate party ! 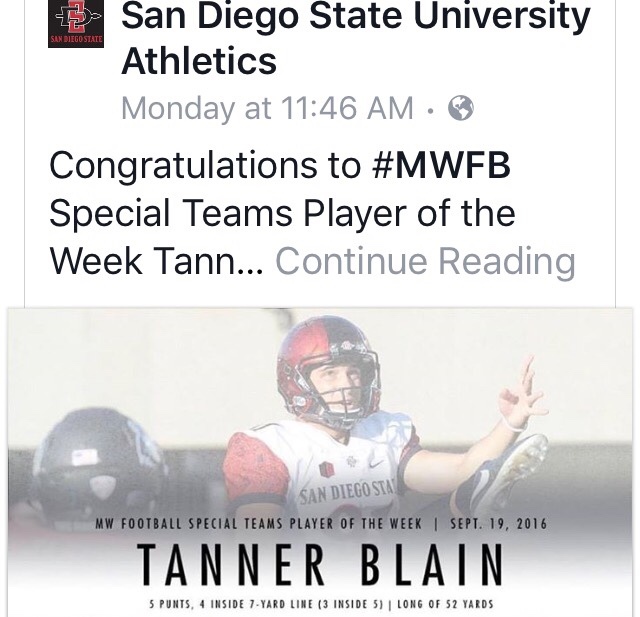 I also brought him some the night before at his hotel..
he had his best game ever.. and was awarded the Mountain West Conference Special Teams Player of the week! So exciting ! Such a great game ! 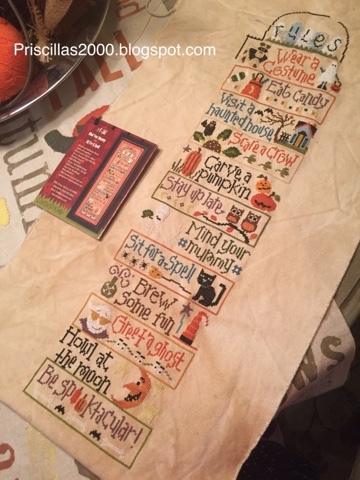 I love the rules of Halloween and the Christmas stitchery,the holidays are around the corner! Congratulations to your son, you all must be so proud of him:). Your cookies looks delicious and love your little companion, adorable! Love your stitching projects, Priscilla--can't wait to see how you end up finishing the LK piece :) I know it will be special! Tanner is on his way to the pros, for sure! How exciting! I thought you all flew out to San Diego last game! I forget they travel! Love the cross stitch! Love the cookies!!! 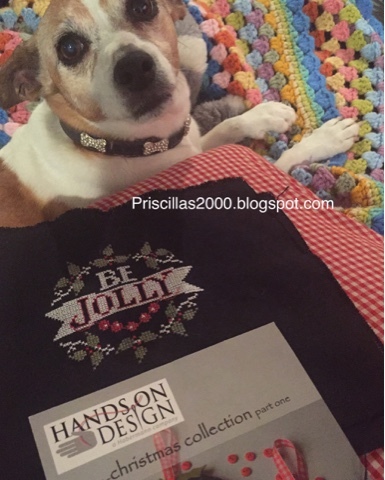 Priscilla, What a great post with your beautiful stitching and your great news on Tanner. Your stitching always amazes me and how fast you get it done. Keep up the good work and all your posts...love them!!! Congratulations to your son! I can imagine how proud you are of him. You were in my old stamping grounds. I graduated from NIU lots of years ago. Lizzie Kate is very cool , I can't wait to see how you decide to finish it.